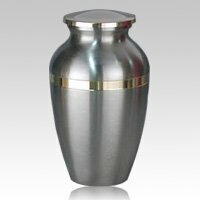 The Argento Bronze Cremation Urn is unique because of its silver color. The color is brushed over a solid bronze base, giving the urn an intriguing look that will withstand the tests of time. This classic style helps connect your precious memories with the eternal virtues of all mankind. "You have a great collection of stones on key chains. I had a hard time selecting the one I bought. The heart blessing stone is a beauty. I use the key chain for my car keys. It brings a smile to my face every time I look at it."